Right, I've updated this section. I've gone through the whole code, examining carefully each bit, so I get all the characters as correct as possible (based on the aerial photo). The code is written from the center outwards, counter-clockwise. There are 8 bits for each character, followed by a separator. This can be distinguished (somehow), because it is about half smaller than a "full bit". In the beginning and end there is additionally one extra 0 bit, otherwise the separator bits couldn't be distinguished! The last ASCII character was originally said to be bell sound (07). I don't know why this is. I've checked it many times, but I get back slash (\). Also some of the capitals are a bit insecure. In the word "oppose" the first two letters could be capitals ("OPpose"), but it's difficult to say (there is only a difference of one single bit). I'm not absolutely sure about the "O" in "COnduit" either. What is the unclear word? I've spend still more time with it and I've decided to abandon my suggestion "EELI!UVE", which was based on bid condensation in a portion of the code. Anyway here's the illustration, if you're interested to know how I got it. Here I've read the first letter as 01000010 instead of 01000101, turning E into B. The problem is that there is one extra bit, marked with the red dot. The arrow is pointing to the separator bit (in other places marked with red dots). The next three letters are same as before, E and L. So far we have BELI. Since I already had found the last two letters to be V and E, I checked if I could fit another E in between to get "BELIEVE". And I managed. But there is another problem. There are now 4 extra bits (0101) with no use. This seems to be quite a big mistake. Could they have made such a mistake? Look at the bits before (0101) and after (010101). You have a row like this: 0101x0101x010101 (separator bits marked with x). The separators (if they are such) are very narrow, as if they were added later? If we ommit the separators, the row is 01010101010101. With such a sequence, you can easily get lost! If they noticed the mistake when they had already continued long way with the rest of the message, perhaps they just added the separators and left the extra bits to puzzle us? If this is made by true masterminds, all this confusion is not an error. I think the word "BELIEVE" is supposed to be found, but there is also a hint that there is something hidden beneath the surface. Probably the English text is only one level of the code, the simple sentences and odd using of capitals suggest this also. The deeper level may have information related to DNA. There is a scientist studying this possibility and I wait for his final conclusions. Also connections to the Mayan / Aztec Calendars are possible. How I understand the message? There are people (institutions) who give us false gifts ("Signs" & other movies, alien toys, wrong ideologies etc.) and broken promises (not revealing important information, false political promises etc.). These people also give us the idea of an alien threat. There is much pain among people because all these false actions and attitudes of the elite. But we must BELIEVE: there is GOOD OUT THERE - meaning the POSITIVE E.T. and other beings. WE OPPOSE DECEPTION. "WE" is the GOOD aliens (even if it's spoken by human representatives). And then, painting in Uzpekistan (a country in Asia, note far from Tibet). 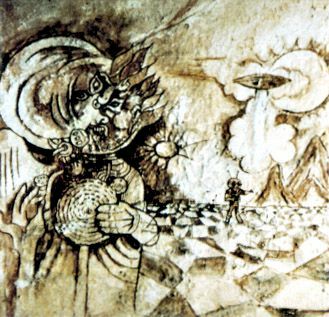 Apparently this painting was done by a Russin artist in 1967, as a part of a project for an international UFO related magazine. I'm still hoping to get more info on this. If it indeed is a hoax (or an experimental project), it would be interesting to know about the artist's motivations and inspiration. 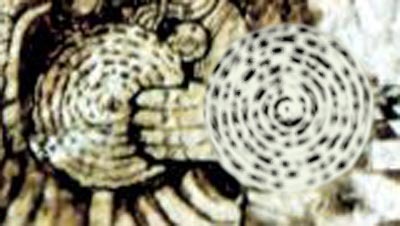 In the painting you can see a strange being holding a disk very similar to the one in the Crabfood crop circle. The being is surrealistic (symbolical). It looks as if its head is on fire. In the landscape there seems to be two suns on the sky. In the following page I describe my dream, which said the alien message is about a new sun! As you can see, there is also a flying saucer and an astronaut-like figure standing on a checker-board patterned floor, where the squares are out of place. The ufo is either leaving or landing, and its smoke is half covering the larger sun. The head of the being could symbolise the planet Earth. It is on fire (on the other side), with eyes especially burning. Could this refer to a time when there are lots of fires on Earth and radiation that hurts the eyes (forest fires, ultraviolet rays)? Behind we can see a larger sphere emerging, this one not burning. This might portray the "new Earth", which is the result of the transformation. The being also seems to have a wing, suggesting that it flies or comes from the sky. Additionally there are many other symbols, like amulets. One way to see this "message" could be: In the time of chaos on Earth, an alien being will come from the sky with a coded disk. They will help us to go through the transformation into a world with no more chaos, but two suns instead of one. The mountains and the checker-board could be a hint to a certain location. Whoever made the painting, wanted to say something! Here I've place the inside part (having appr. 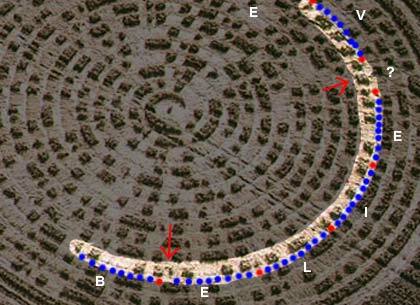 the same amount of rotations) of the crop circle code over the painting. I have blurred it for better match. The similarity is far too great to be just co-incidential, don't you agree? Even if the cave painting is a fake from 1967, it still was painted BEFORE the Crabwood formation was made. A connection must exist!